Just when we thought a new café on Prospect road was exciting enough, this new brunch destination is also home to a vintage clothing market! Mekko Market and Café is the newest foodie and shopaholic spot to get down to, with plenty of vegan, vegetarian and gluten free options. Ah, it never gets old seeing fantastic ideas you wish you came up with yourself – and that's exactly how we feel about the Mekko Market! The market has a rental rack system, so you can sign up to sell your pre-loved goodies including clothes, shoes and accessories. All you have to do is book a single rack for $69 or a family rack for $99, online or instore. And the best part? You don’t have to stick around to sell your items, just come back to grab any unsold items at the end of your rental week! Yep, I bet we all agree this is one great concept! Food options include a brunch menu, a salad bar menu, a burger menu and a dessert menu, talk about variety! 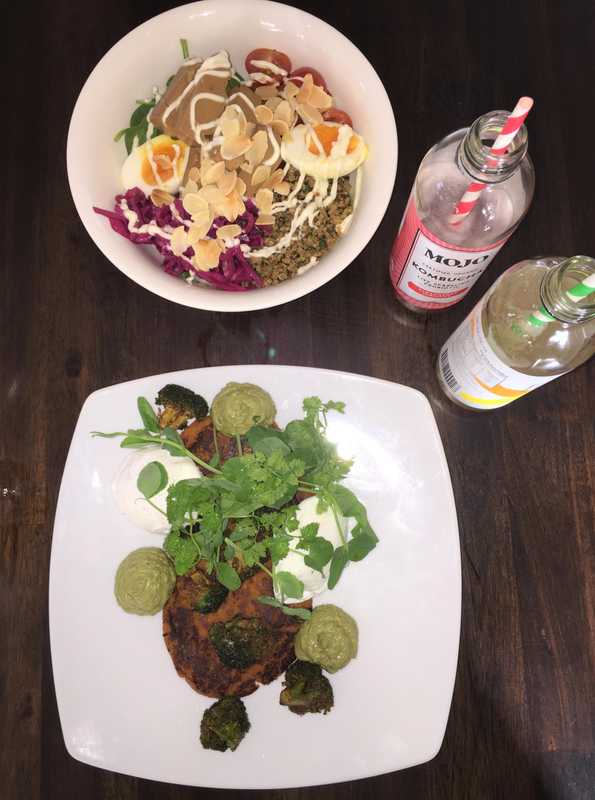 We tried the Sweet Quinoa O’Mine off the brunch menu and oh my! This one comes with sweet potato quinoa patties, burnt broccoli, salad, avocado pepitas mousse and poached egg. And yes, the burnt broccoli was the best kind of broccoli we've ever had, you won’t be disappointed! “And for the lady perhaps a salad?" The Tofu salad with spiced quinoa, kale, cucumber, corn, avocado pepitas mousse, pickled cabbage and pepitas was just the healthy fix we needed. Not only did it make our insides happy, but our taste buds had plenty to brag about too! For dessert, we got to pick from a range of handmade cakes, with gluten free and vegan options available. Of course, we had to try the prettiest one – who could go past a green, passionfruit mousse? It was definitely unlike anything we’ve tried before, in the best way! So, if you aren’t already sold, be sure to check out the Mekko Market and Café website for more info. Thank you Mekko Market and Café for having us! Header image via Mekko Market and Café.